Paul Brodie's Aermacchi Race Diary 2005Flashback Fabrications Ltd.
Race bikes are like anything else- they get worn out too. My last race was in Oct of 2003, and my bike was worn out. The motor was noticeably down on power; the rear tire had gone hard and took several laps to warm up. Even then it was marginal, and the front brake pads were quite worn, making brake fade a problem. The rear chain was a couple of years old, and stretched. The front tire was also 2 years old, but still worked fine, thank you Dunlop! Taking the bike apart, I also discovered the rear fender was cracked, so was my exhaust where it had been scraping the ground. It was time to redo just about everything. Racing has a lot to do with confidence, and racing a bike that you KNOW is worn out does nothing to inspire confidence. I’d spent 2004 learning to be a trials rider on my 99 Gas Gas. Can trials riding make a person a better road racer? Bill Lomas was a world champion road racer (in the 50s) and often won the British Trials Championship. Jordon Szoke rides a trials bike, so does Steve Crevier. Does this answer the question? Probably not. 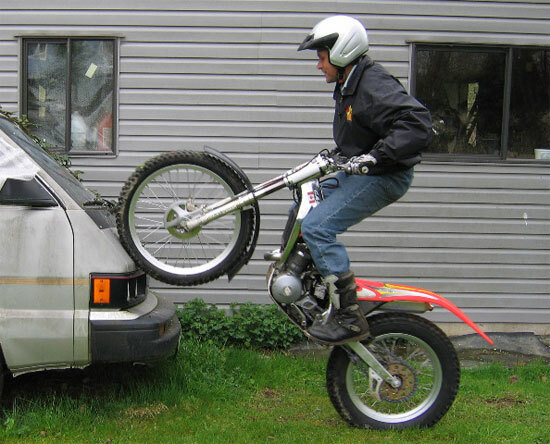 Now, if Valentino Rossi rode a trials bike . . .
I’ve always wanted to build a big bore motor, and now was the time. I’d been collecting parts- Yamaha SRX 600 rod and crankpin, Ducati Pantah piston, oversize liner, ’74 cases. The bore was now 79mm, making displacement 392cc. I also reangled my intake valve one degree. Oversize valves want to touch each other on overlap, so the seats have to be sunk into the head, which isn’t good for compression or breathing. Reangling was designed to solve these problems. Many hours went into this motor. Actually, more than that. It finally fired up on the Friday before race weekend, at 2pm. It sounded healthy, and the ignition timing looked good. It was time to load up and head for Seattle. Saturday practice, Seattle. The engine didn’t want to fire up, and when it did, it sounded tight and would stop. Plus the rocker feed line was leaking. Not good. I tried the motor a few more times- the same. I started visualizing going home, but decided on one more time; the motor caught, kept going, and didn’t sound tight. I fixed the oil leak and got on the track, two fingers on the clutch. The tach was wildly optimistic for some reason, but the motor pulled well, and my fingers slowly relaxed from the clutch as my confidence grew. Second and last practice- the tach had gone truly crazy, and the engine was now missing, so I thought “battery”. Sure enough, the engine died after 3 laps, so that was the end of my day. I sat on the infield and watched everyone else ride around. I spent the afternoon driving to Tacoma Mall and purchasing two new batteries. Always have a spare. Sunday, May 8, Seattle. Mothers’ Day too — my competition was two Honda 350s, and a converted Montessa 250 flat tracker. One Honda packed up after practice, the other had yellow plates designating a novice rider. The Montessa lacked top end. Practice was on a damp track, and I enjoyed being out there. The new battery had solved my crazy tach problem. First race was on a dry track, and I chased the two Nortons. Well, one’s an 8-valve Nourish in a Seeley frame, and the second one is hardly stock either.. I finished with the Honda 22 seconds adrift. My motor pulled great out of corners, but lacked top end. Would only pull 7 grand in 5th. Second race started in the dry, also. The two Nortons were on the front row, our 500s were on the second row of the grid. The flag dropped, and my little Aermacchi rocketed past both Nortons and into the lead! It took them a few hundred yards to catch up and get past. I chased them for a lap, but they were gone on that long straightaway. The rain started on lap 2 — all corner workers holding out the red and yellow striped flags and pointing their fingers at the sky. When you’re on the track, it’s very hard to tell how hard it’s raining or just how much to slow down. I slowed and watched the Honda with yellow plates slowly catch me. I was counting laps, and knew his time was running out. I continued for the win. The Montessa had seized at the end of the straightaway. I needed to know what was really going on with my motor, so it ended up on the dyno with an O2 sensor in the pipe. Horsepower was flat and down at 32.8 rear wheel, dropping off sharply at 7600 rpm. Jetting “spiked” to normal at 4400 rpm, richened sharply to 5500 rpm, was perfect to 6600 rpm, then got slightly “fat” until redline. So, jetting from 5500 – 8000 wasn’t the problem. I was down 7 hp, figuring a good 392 motor should easily crank 40 rear wheel hp. Was my 35mm Spanish Amal too small? Was my porting, valve and piston mods lacking somehow? Cam timing needing a tweak? Ignition too far advanced? Stay tuned. Also, I have details and pics showing how this 392 motor evolved . . . check my website. After the dyno run, I took off the head and barrel to check things out. I discovered the exhaust guide was slightly too long, and the keepers were hitting. The guide was also now too tight. It just shows you cannot overlook anything on a race motor. Everything else looked good, so I fixed the guide problems, put it all back together, and headed for California. I arrived at the track at 7am, which usually meant lots of time before practice at 9am, but soon found out I was in practice group #1 at 8am! Not much time to go to registration, unload, bike tech, gear tech, check tire pressure, gas up, have breakfast, get leathers on and go to the riders’ meeting. The track is basically the same, except for the chicane, now known as turns 9 and 9a, in the back esses. The speeds were getting too high, and the walls were getting too close for reasonable safety. Sears Point (now known as Infineon Raceway) is a LOT of fun to ride. Not many straights, but lots of corners and elevation changes. My engine doesn’t have a lot of top end, but it does have torque, and that was great for this track. Towards the end of first practice, the black flag came out, and . . . it was aimed at . . me! The noise police had me cornered; I was nabbed at 106 dB. The limit was 101 dB. It was a bit unfair — the microphone is on top of the timing tower as we accelerate away from the hairpin towards start / finish. We had low cloud cover, plus a concrete barrier on either side. I had used up my one chance, and if I was nabbed again my practice day was over, so this was serious. I plugged the end of my Supertrapp, short-shifted that section, and was never pulled again. My lap times dropped into the 2:09’s, and I figured I was on track for Sunday. Sunday, RACE DAY. Vintage was first practice, and also the first race. There were five of us in 500 Vintage. Brid Caveney had a beautifully prepped BSA B50 and his race credential were impressive. Championship here, championship there. Ron Melton showed up Sunday am. Brid described him as “a racer who gives no quarter, often snapping at Roper’s heels”, meaning Dave Roper, very fast company indeed! Sears is his local track, and he did a 2:06 in warmup on his 500 Manx, which looked more like a new British reproduction than an original Norton. The race is run by the AFM, and organization is good. There are so many racers, you can only pre-enter. I even heard the announcement, “if you have signed up, and know you’re not racing, come and tell us, because we have waiting lists of racers…” Grids are huge, usually 80 racers on the track at a time. Vintage was gridded behind little Kawasaki GPZ’s, and our race was started in four “waves” of bikes… We had one race only, so it was do or die. We gridded, the green flag waved violently, and we were off! Up the hill, into turn 2 behind Ron and Brid. I could stay with them, but Ron was already starting to pull away. On lap two I got by Brid on the outside exiting the carousel, and we were already into the traffic of the slower GPZ riders. Meanwhile, Ron had motored on. Charlie Sexton surprised me next by coming by on his fast Bultaco 250 racer, but I got him back and made it stick which felt good because he beat me last time at Sears. Lap 7 the rear tire slid, so I knew I was pushing. End result? Second place to Ron Melton. I checked lap times: Ron did a 2:05:151 to my 2:06:988, so I was about 1.8 seconds off the pace. That was OK, I was giving up 110cc and many HP on a track I hadn’t ridden in four years. I picked up my plastic trophy. Coming home, disaster struck. The van and entire contents were stolen from a motel parking lot on the coast of Oregon. But that’s another story . . .